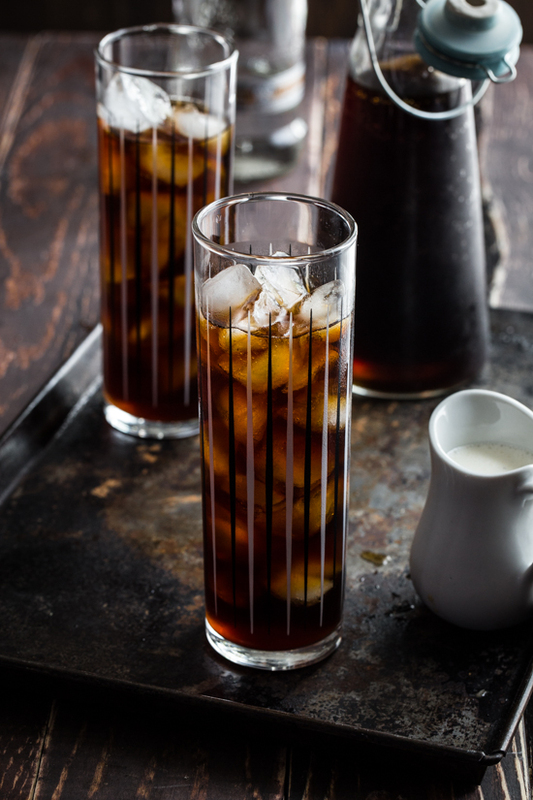 This three ingredient Iced Coffee Cocktail is a quick and simple cocktail, perfect for a warm summer night. I make no secret of my love of coffee. We’ve been in a pretty long term relationship, even though recently I’ve been trying to put a bit of distance between us. At least with it’s caffeinated version. It doesn’t matter though, because coffee and I will always be BFF’s. 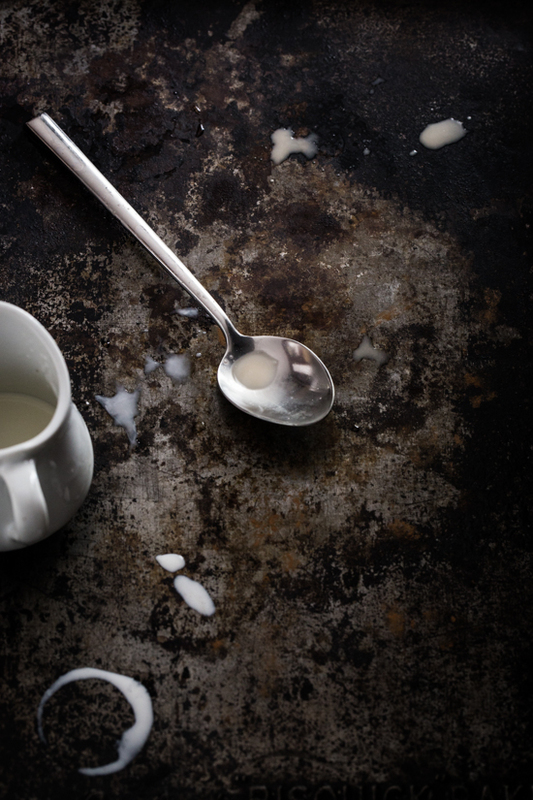 It’s what I look forward to in the mornings – the quiet house and a fresh cup of coffee. Seriously, can it get any better? I guess chocolate would up the ante. I’ve made this version many times, and have tweaked the amounts over the years. First of all, it’s really hard to find an actual pound of coffee. They are all 14 ounces or 12 ounces and unfortunately, my favorite Newman’s Own comes in 10 ounce packages. This is, quite frankly, kind of a pain but only in the sense that I need to do some coffee math. It’s the most delicious kind of math, though. I have settled on the 10 ounce package of coffee mixed with five quarts of cold water in a large, lidded plastic food bucket or container. I use the same Snapware Food Storage Container that I make my bread dough in. I just combine the coffee and water, place the lid on and let it sit at room temp for about 8 hours or over night. Longer is ok, too. When it comes to straining out the coffee mixture, I like to line a mesh sieve with a coffee filter set over my batter bowl (the spout makes for easy pouring into mason jars later). Ladle the coffee into the lined mesh sieve until all of the cold brew coffee is filtered and ready to go. This process is easy peasy, but it can take a little while. I find myself ladling, and then walking away for a while to give it time to strain. And then repeating the process. Again, not hard, it just takes patience. 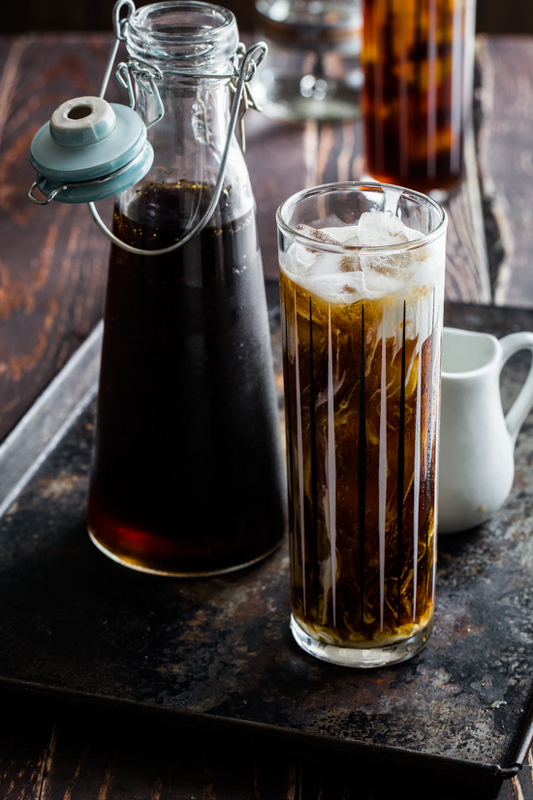 At the end of the process you are award with some seriously strong and fabulous cold brew coffee that will rock your world and cool down your sweaty, humidity laden summer afternoons. Side note: This is the point in the year when I start whining about the insane Ohio humidity and how it makes me endlessly cranky. I will try my best to keep the complaining to a minimum and this coffee helps take the edge, that’s for sure. Especially when there is a splash of vodka in it. But more on that in a minute. Anyway, just store the coffee in quart size mason jars in the fridge and honestly, this stuff will last for a couple of months in the fridge. I typically make one large batch and it gets me through the hottest months of summer. 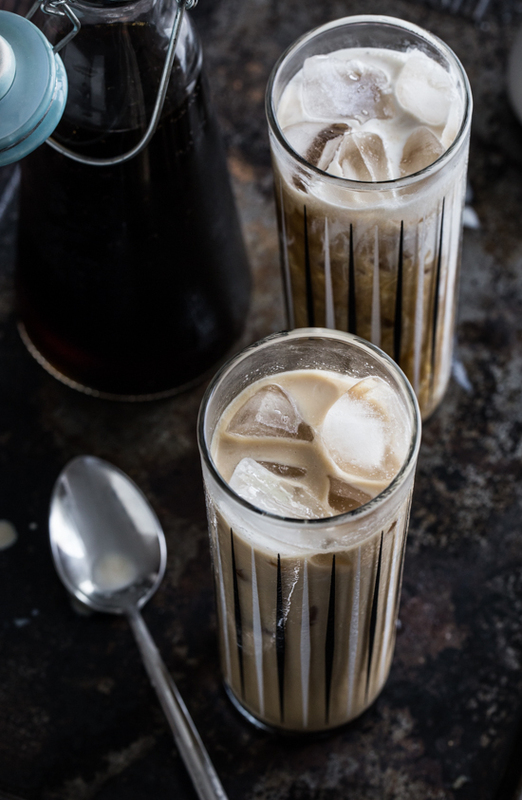 When it comes to drinking the coffee, I will fill a big glass with ice, add the strong, cold brew coffee and a touch of flavored creamer or simple heavy cream. 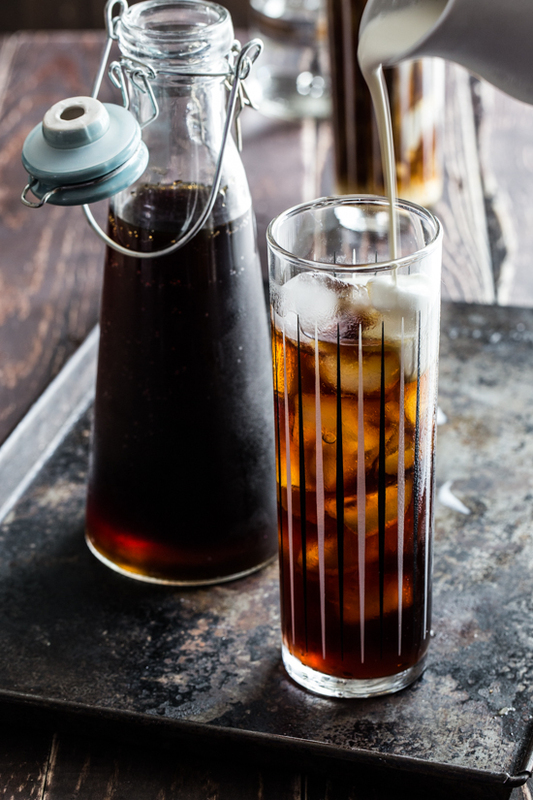 Because the coffee is really strong, you don’t have to worry about the ice watering it down. It really is an amazing concoction! 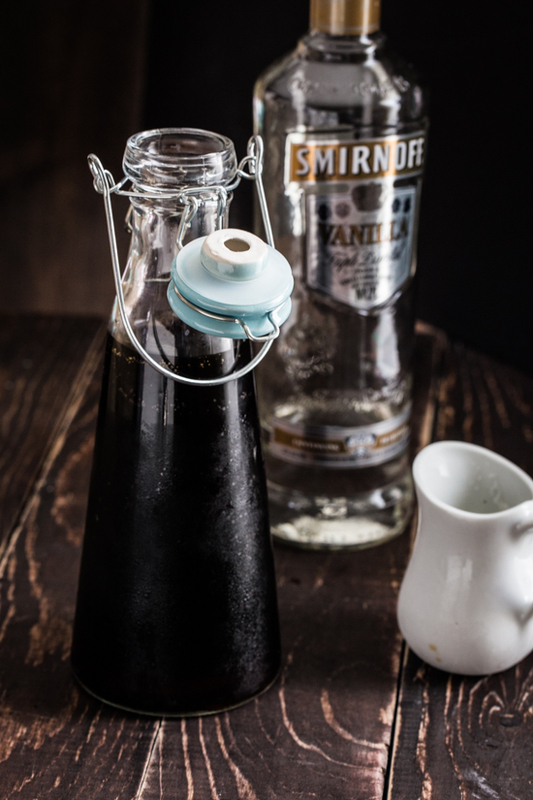 What is even better is when you add a splash of deliciously sweet flavored vodka, like vanilla or caramel into the glass with your cold brew coffee and cream to make a quick, simple and decadent ice coffee cocktail. Oh yes, this drink is just plain good. Ok, more than good. Great. And definitely perfect for Cocktail Friday! In a large plastic lidded container mix coffee grounds and cold water. Cover with lid and let stand at least 8 hours or over night. Line a mesh sieve with a coffee filter and place over batter bowl with spout. Ladle coffee ground mixture into lined sieve, small amounts at a time, straining the cold brewed coffee. Change the coffee filter as needed. Decant strained coffee into quart mason jars and store in the fridge. Makes about 5 quarts of cold brew coffee. Fill a glass with ice. Add coffee, vodka and cream. Stir. Enjoy! 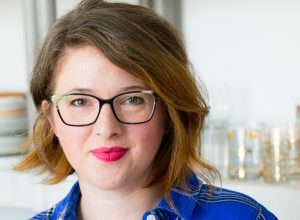 You need to try this, Laura!! Oh my goodness – this is blowing my mind!! I bet it was! I’m trying that next time <3 Thanks, Amy! I like to add vanilla or caramel flavored vodka to my iced coffee along with a small amount of cream.